I haven't been blogging much, because I've been hard at work on a middle grade novel. It takes place in an alternate universe, but with a rural setting. I've had to draw a map for myself so I can figure out where everything is. But what I keep picturing in my mind is my grandparents' house, which was built in 1926. More on this later. Picturing a familiar place while trying to describe a made-up one made me think about what I picture when I read novels. do you picture certain scenes taking place in locales that are familiar to you? Say, your childhood home? Your backyard? Okay. Promise not to laugh. 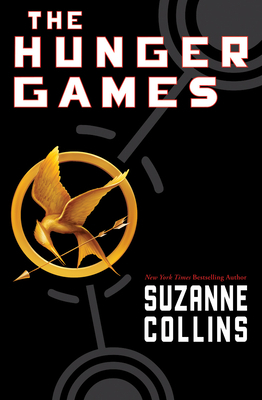 When I first read The Hunger Games, I couldn't help picturing the fence around Katniss's district (the one she illegally crosses to go hunting) as the fence around my elementary school playground. And yes, there was a woods (albeit a tiny one) beyond that fence. 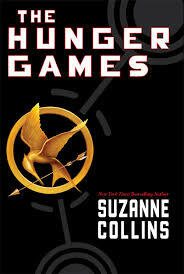 So now when I re-read the book, I automatically picture Katniss hunting in that little woods beyond that same playground. I can't help it. And that sense of place carries over to the Arena -- which, you guessed it -- looks like the larger section of the playground in my mind. Hey, it was a big playground, and not just because I was small. With other scenes or while reading other books, I'm usually able to conjure up a setting from my imagination. But occasionally, I find myself falling back on familiarity and picturing places I've actually known. I have no clue why I do this, but I do. Perhaps a psychologist could answer that. The comfort of familiar turf? A place where I felt safe? Does it mean my imagination isn't strong enough to create every scene from scratch? Or does it simply mean that I had a nurturing childhood? When I read Charlotte's Web, I picture my grandparents' house -- even though it wasn't a farm. (*Also note that I didn't read Charlotte's Web until I was in my 20s, which was when I lost my grandparents -- ooh, deep psychological stuff here*). They had three acres so since I grew up in the suburbs on a third of an acre, maybe to my mind their property was as big as a farm. And that's probably why I keep picturing it while writing a novel that takes place on a farm. Tell me about your favorite children's books. What scenes have you pictured taking place in familiar settings? "As for fiction, we're open to anything for middle-grade readers and teens, although we're always more interested in voice than trends." It's nice to know there's at least one publisher out there who isn't looking for the latest trend. Here's the link so you can read the entire article. Michelle Kemper Brownlow posted some different (and equally helpful) quotes from the same article here. Hey all. I'm back. Having accepted Laurie Halse Anderson's "Double-dog dare," I stayed away from this blog (and unfortunately all of yours, too -- ulp, sorry). I stayed away from Facebook and Twitter... and television (well, except for some of the Olympics). And I wrote. I'm happy to say that the middle grade novel I was stuck on six months ago (I stalled out at 4983 words), now has seven chapters and 11,149 words! Woo hoo! And I'm finally starting to imagine where it's heading (I've never been big on outlining). "However, as an unpublished author seeking representation, your time is best spent developing your craft. Write first, tweet later." Exactly what Laurie Halse Anderson was talking about. So I may pop in from time to time with a book review, but I won't be on here very much. And I'll leave you with a few Gems of the Week (or Month? ), because, of course, I've also been reading. I can't NOT read. That would be like, well, not breathing. Adorable. I would have cherished this book when I was 8 years old. It's about a mouse in search of a safe home, the friends she meets, and in particular, a boy named Joseph who happens to be the assistant to the naturalist John James Audubon. You'll learn something about Audubon, and about New Orleans in 1821. Mostly you'll be charmed by this engaging tale, though it's not without its frightening moments (some grisly hunting scenes). With lots of lovely pencil drawings. This reminded me of The Rescuers by Margery Sharp, with illustrations by Garth Williams, or even The Mouse and the Motorcycle by Beverly Cleary. 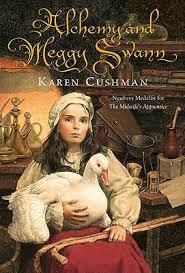 ALCHEMY AND MEGGY SWANN by Karen Cushman (Clarion Books, $16.00, April 2010, ages 10 to 14). Meggy Swann has just arrived in London, having been sent away from her village by her mother. The father she never knew, an Alchemist, had asked for her. But after taking one look at her, with her sticks for walking, he ignores her, and Meggy is left to fend for herself. She has only her goose friend, Louise, for company. But Meggy is stubborn and smart and soon finds a way to make herself useful. Set in 1573 (Elizabethan England, but before the time of Shakespeare), this is the newest novel by the author of Catherine, Called Birdy and The Midwife's Apprentice. The advanced reader's copy says the book is for ages 10 to 14, but I'd judge it fine for 8 to 12. 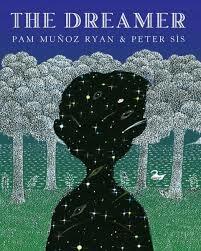 THE DREAMER written by Pam Munoz Ryan and illustrated by Peter Sis (Scholastic, $17.99, April 2010, ages 9 to 14) . Stunning, poetic, and extremely thought-provoking. This beautiful dream of a novel is loosely based on the childhood of Chile's most famous poet, Pablo Neruda. 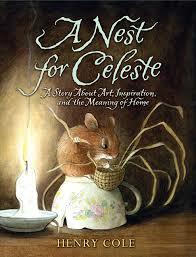 It's the story of Neftali Reyes, a thin, sickly child who grows up collecting things: seashells, birds' nests, keys, words. Neftali wants to write, but his strict and demanding father wants him to study law or medicine. Includes an author's note, some information about Pablo Neruda and a sampling of his poetry, as well as numerous illustrations by the Caldecott-winning artist Peter Sis. (Final art not in advanced reader's copy). This book will win all kinds of awards. You heard it here first.